Buying and Selling Makati Condominium! No One Knows Makati Like We Do ! 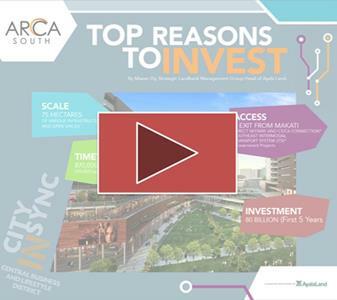 Ayala Land's rising prime community - Arca South. Ayala Land master-planned a 75-hectare, mixed-use development located along the East Service Road of the South Luzon Expressway (SLEX). This will be a community of commercials development with retail, commercial office and residential development. With the building of the Itegrated Transport System (ITS), the newest south central station to public utility vehicles, Arca South will be more accessible to provinces like Laguna, Batangas, Quezon and the Bicol Region. Other areas like Metro Manila and the rest of Luzon will be very much accessible via Philippine National Railways or PNR. The planned extension of the skyway will serve as the direct link to the international airports, the Makati Central Business District (CBD) and Bonifacio Global City (BGC). Arca South, the newest business district, south of the metro.